The zener provides a constant voltage of 20 V to unijunction transistor Ql, except at the end of each half-cycle of the input when the line voltage drops to zero. 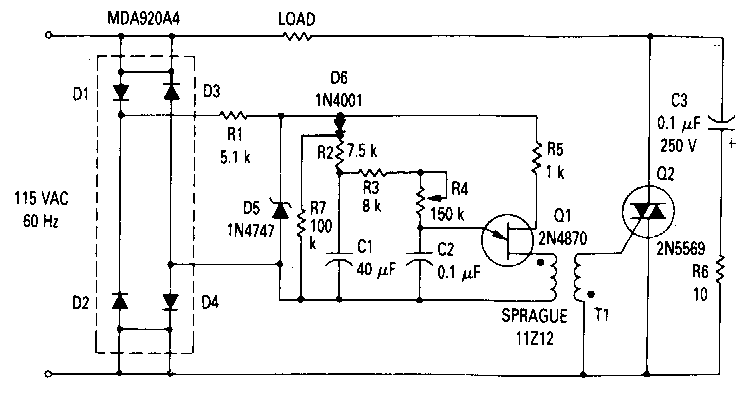 Initially, the voltage across capacitor Cl is zero and capacitor C2 cannot charge to trigger Ql. Cl will begin to charge, but because the voltage is low, C2 will be charged to a voltage adequate to trigger Cl only near the end of the half cycle. Although the lamp resistance is low at this time, the voltage applied to the lamp is low and the inrush current is small. Then the voltage on Cl rises, allowing C2 to trigger Ql earlier in the cycle. At the same time, the lamp is being heated hy the slowly increasing applied voltage. By the time the peak voltage applied to the lamp has reached its maximum value, the bulb has been heated sufficiently to keep the peak inrush current at a reasonable value. Resistor R4 controls the charging rate of C2 and provides the means to dim the lamp. Diode D6 and resistor R7 improve operation at low-conduction angles.